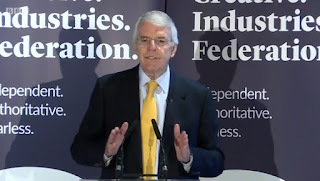 The former Conservative prime minister Sir John Major has launched a scathing attack on Brexit and said MPs should be given a free vote on whether to accept or reject the final Brexit deal. 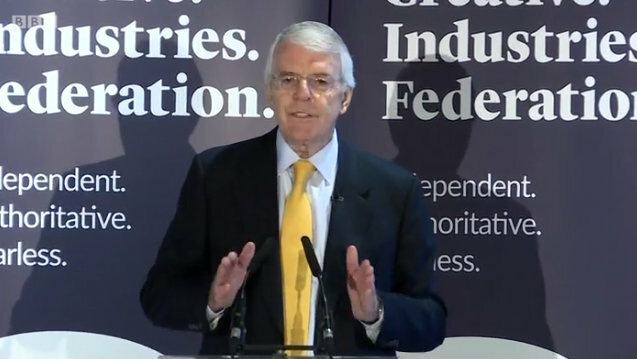 The ex-prime minister argued that MPs must vote with their "own conscience" on whether the deal on offer will leave the UK better or worse off. In a speech in London that comes at the lowest point so far in the 18-month withdrawal negotiations [BBC], Major argued parliament had a duty to consider the "wellbeing of the people", as well as the will of the people in the first referendum. "This must be a decisive vote, in which parliament can accept or reject the final outcome; or send the negotiators back to seek improvements; or order a referendum," Major told an audience at Somerset House in central London on Wednesday afternoon. Brexit matters to our creative industries. They express our culture and values - but give so much more. Nearly 10 per cent of our national workforce is in creative industries. They are often the young - and overwhelmingly in small units up and down the UK. Job growth outpaces every other part of industry - especially in the Midlands and Yorkshire. Their exports total over £35 billion a year, but their added value to our country - both economically and socially - is incalculable… and far beyond cash. Our decision to leave the EU faces the creative industries with a variety of threats that could harm their future, both in financial and human terms. So I am delighted to be their guest here this afternoon - to talk of Brexit. For years, the European debate has been dominated by the fringes of opinion – by strong supporters of Europe or convinced opponents. But, as we approach Brexit, the voice of middle opinion mustn't be overlooked. I am neither a Europhile nor a Eurosceptic. As Prime Minister, I said "No" to federal integration, "No" to the Euro Currency, and "No" to Schengen – which introduced free movement of people within the European Union but without proper control of external borders. Of course, the "will of the people" can't be ignored, but Parliament has a duty also to consider the "wellbeing of the people". The "will of the people" - so often summoned up when sound argument is absent - was supported by only 37 per cent of the electorate. Sixty-three per cent voted either in favour of membership - or did not vote at all. Brexit has been the most divisive issue of my lifetime. It has divided not only the four nations of our UK, but regions within them. It has divided political parties; political colleagues; families; friends - and the young from the old. We have to heal those divisions. They have been made worse by the character of the Brexit debate with its intolerance, its bullying, and its name-calling. I welcome rigorous debate - but there must be respect for differing views that are honestly held. In this debate there are no "remoaners", no "mutineers", no "enemies of the people" - just voices setting out what they believe is right for our country. In recent weeks, the idea has gained ground that Brexit won't be too bad; that we will all get through it; that we're doing better than expected - and all will be well. Of course we will get through it: life as we know it won't come to an end. We are too resourceful and talented a nation for that. But our nation is owed a frank assessment of what leaving Europe may mean - for now and the future. I fear we will be weaker and less prosperous - as a country and as individuals. And - although it grieves me to admit it - our divorce from Europe will diminish our international stature. Indeed, it already has. As a result, we are already becoming a lesser actor. No one - Leaver or Remainer - can welcome that. We are all urged to be "patriotic" and get behind Brexit. But it is precisely because I am patriotic that I oppose it. But this sweet spot is artificial. It won't last. Prosperity isn't built on devaluation of the currency. More exports on the back of other countries' economic growth is not a secure position. We are now the laggard at the bottom. We have become the slowest of the world's big economies, even before we surrender the familiar advantages of the Single Market. Our determination to negotiate the divorce bill and a new trade deal at the same time was going to be "the fight of the summer" - but instead became an immediate British retreat. There was to be a "points based" immigration system. There isn't, and there won't be. We were to become the "Singapore of the North". No more: we have retreated from a policy of lower taxes and de-regulation. No transition period was going to be needed. But we have now asked for one - during which we will accept new EU rules, ECJ jurisdiction, and free movement of people. I don't say this to be critical. I do so to illustrate that unrealistic aspirations are usually followed by retreat. That is a lesson for the negotiations to come. A willingness to compromise is essential. If either side - the UK or the EU - is too inflexible, too unbending, too wedded to what they won't do - then the negotiations will fail. The very essence of negotiation involves both "give" and "take". But there are always "red lines" that neither side wishes to cross. In successful negotiations those "red lines" are traded for concessions. If our "red lines" are held to be inviolable, the likelihood of no deal - or a poor deal - increases. Every time we close off options prematurely, this encourages the EU to do the same – and that is not in our British interest. A bad Brexit - for Britain - will surrender these, and other, advantages. For the moment, our self-imposed "red lines" have boxed the Government into a corner. Alarmed at the negotiations so far, the financial sector, businesses, and our academic institutions, are pleading for commonsense policy to serve the national interest and now - fearful they may not get it - are making their own preparations for the future. This isn't "Project Fear" revisited, it is "Project Know Your History". Across the United Kingdom - businesses are expressing their wish to stay in the Single Market and Customs Union. But "No", say the Government's "red lines". Businesses wish to have the freedom to employ foreign skills. "No", say the Government's "red lines". Business and academia wish to welcome foreign students to our universities and - as they rise to influence in their own countries - we then have willing partners in politics and business for decades to come. "No", say the Government's "red lines". This is not only grand folly. It's also bad politics. The national interest must always be above the Party interest, but my Party should beware. It is only fear of Mr Corbyn and Mr McDonnell that prevents a haemorrhage of business support. Without the comprehensive trade deal the Prime Minister seeks, we risk economic divorce from the EU, and the chill embrace of a "hard" Brexit with WTO rules. A Minister has speculated we might face tariffs of three per cent. Not so. It is more likely that we will face tariffs on cars (10 per cent), food (14 per cent), drinks (20 per cent), and dairy products (36 per cent). Even if a successful negotiation were to halve these tariffs, our exports would still be much more expensive to sell – and this would apply far beyond agriculture and the motor industry. If we and the EU agreed to impose nil tariffs - as some have speculated - WTO rules mean we would both have to offer nil tariffs to all countries. That isn't going to happen. China, the US and Japan all have side agreements with Europe on standards, customs cooperation, mutual recognition and investment. These economic giants did so to protect their own trade even though none of them is exposed as we are - still half our entire exports go to Europe. Ultra Brexit opinion is impatient to be free of European relationships; to become - in their words - a "global player", "sovereign", "in control". I believe they are deceiving themselves and, as a result, they are misleading the British people. Before the modern world took shape - their ambition would have been credible. But the world has changed, the global market has taken root, and - if we are to care for the people of our nation - philosophical fantasies must give way to national self-interest. We cannot prepare for tomorrow by living in the world of yesterday. I don't doubt the convictions of those who long for the seductive ambition of British exceptionalism. But these sentiments are out-of- date and, in today's world, wrong. It is not my purpose to stir controversy, but the truth must be spoken. The ultra Brexiteers have been mistaken - wrong - in nearly all they have said or promised to the British people. The promises of more hospitals, more schools, lower taxes, more money for transport were electioneering fantasy. The £350 million a week for the NHS was a ridiculous phantom: the reality is if our economy weakens - as is forecast - there will not only be less money for the NHS, but for all our public services. We were told "Europe can whistle for their money" and we would not pay a penny in exit costs. Wrong again. Europe didn't even have to purse her lips before we agreed to pay £40 billion to meet legitimate liabilities. I could go on. But suffice to say that every one of the Brexit promises is - to quote Henry Fielding - "a very wholesome and comfortable doctrine to which (there is) but one objection: namely, that it is not true.". People should pause and reflect: if the Brexit leaders were wrong in what they said so enthusiastically before - are they not likely to be wrong in what they say now? The Prime Minister is seeking a "frictionless" border between Northern Ireland and the Republic. She is absolutely right to do so. This is a promise that must be honoured, and I wish her well. But, so far, this has not materialised - nor, I fear, will it - unless we stay in "a" or "the" Customs Union. Those of us who warned of the risks Brexit would bring to the still fragile Peace Process were told at the time that we "didn't understand Irish politics". But it seems we understood it better than our critics. We need a policy to protect the Good Friday Agreement - and we need one urgently. And it is our responsibility to find one - not the European Union. Many electors know they were misled: many more are beginning to realise it. So, the electorate has every right to reconsider their decision. Meanwhile, our options become ever narrower. A Norway deal won't do. Nor will a Swiss deal. Nor a Ukraine deal; a Turkey deal; or a South Korea deal. No, to them all, say the Government's "red lines". So, little is left, except for "cherry picking" - which the EU rejects. Or a comprehensive deal - which will be very hard, if not impossible, to get. So compromise it must be - or no deal at all. It is now widely accepted that "no deal" would be the worst possible outcome. The compromise must, therefore, focus around our accepting Single Market rules (as Norway does) and paying for access. Or an enhanced "Canada deal" - and it would need to be enhanced a very great deal to be attractive. The Canada deal largely concerns goods - whereas the bulk of UK exports are services. But what we achieve to protect our interests may depend on what we concede: it is, as I say, "give" and "take". If our "red lines" dissolve, our options enlarge. Our minimum objective must be that "deep, special and bespoke" trade deal the Prime Minister has talked about. So, some unpalatable decisions lie ahead - with the cast-iron certainty that the extreme and unbending Brexit lobby will cry "betrayal" at any compromise. But it is Parliament, not a small minority, that must decide our policy. I spoke earlier of the "divisiveness" of Brexit across our United Kingdom. But, in due time, the debate will end and - when it does - we need the highest possible level of public acceptance for the outcome. It is in no one's interest for the bitterness and division to linger on. I see only one way to achieve this. It is already agreed that Parliament must pass legislation giving effect to the deal. A "meaningful vote" has been promised. This must be a decisive vote, in which Parliament can accept or reject the final outcome; or send the negotiators back to seek improvements; or order a referendum. That is what Parliamentary sovereignty means. But, to minimise divisions in our country - and between and within the political parties - I believe the Government should take a brave and bold decision. They should invite Parliament to accept or reject the final outcome on a free vote. I know the instinct of every Government is to oppose "free votes", but the Government should weigh the advantages of having one very carefully. It may be in their interest to do so. There are some very practical reasons in favour of it. Brexit is a unique decision. It will affect the lives of the British people for generations to come. If it flops - there will be the most terrible backlash. A free vote would better reflect the reality that - for every 17 voters who opted for Brexit - 16 opted to remain in the EU. No-one can truly know what "the will of the people" may then be. So, let Parliament decide. Or put the issue back to the people. I have been a Conservative all my life. I don't enjoy being out of step with many in my Party and take no pleasure in speaking out as I am today. But it's as necessary to speak truth to the people, as to power. Leaving Europe is an issue so far-reaching, so permanent, so over-arching that it will have an impact on all our lives - most especially on the young and the future. With only 12 months to go, we need answers, not aspirations. This is far more than just a Party issue. It's about the future of our United Kingdom, and everyone who lives in it. That is what matters. That is why I'm here today.